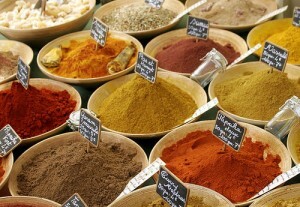 First, a word about spices. 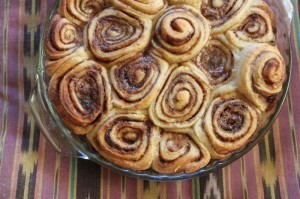 This recipe for cinnamon buns from the amazing Heidi of 101 Cookbooks called for ground cardamom. I was certain I had it, but I didn’t. So I didn’t make these for Christmas, as I had planned. Instead, when the shops had re-opened, I went out to procure. But of the three stores I went to, it was not to be found. Trader Joe’s didn’t have it. Ralph’s didn’t have it. Vons did, but at $17.99 (!???) for 2 ounces, I couldn’t stomach the purchase. Instead, I had the Brit swing through Little India and buy me a 3-ounce packet. Cost: $4.99. Lesson learned: Don’t ever bother with supermarket spices. Either go to the grocer who caters to the Mexican population or find the ethnic mart of your choice. The bonus of having a Little India nearby is I can always get giant bags of spices cheap, mango chutney, Basmati rice by the ton AND rose or saffron-flavored ice cream. I digress. These cinnamon buns are my second foray into yeasty things. Yeast scares me. First, it’s alive. Second, I am unsure how to handle it, and I’m always afraid I’ll accidentally create something….sentient. And creeping. Fortunately, the yeast I found in the back of my pantry was from 2008. Combining it with warm milk did nothing but create funky-smelling little lumps. I had to run back to Trader Joe’s to buy a more recent packet. Unfortunately it was the third time I’d been in that day. Eyeballs were rolled. I was starting to sense that perhaps the universe had something against me and cinnamon rolls. But with the two key ingredients painstakingly now procured, I was committed. The recipe isn’t complicated, but I’m just going to point you directly to it on Heidi’s site. You can read it here in detail. Several problems, all of them my fault, I’m sure, arose in the course of making these cinnamon rolls. (pun quite intended) While I had great fun kneading the dough for 10 minutes, my resulting bouncy baby ball of dough did not rise to double its size when left covered in a bowl for an hour. Maybe my kitchen was too cold? Maybe something else? I put the bowl in the oven, and thought about heating it to 200 degrees or something but opted not to in the end for fear of launching unimaginable disasters. And anyway, it worked, I think. Second problem – rolled out two sheets of dough, spread my butter and sugar-cinnamon filling on, rolled them back up, sliced them…and didn’t freeze them, which is what you’re supposed to do before letting them rise a second time as they thaw on your counter the next morning. We all know how I can’t manage anything having to do with frozen goods left to rise overnight. So I opted to skip the freezing part and inadvertently skipped the second rise. Whoops. I believe I stuffed too many into the pie dish as well. Well, so. How’d they turn out after all that? The girl thought these were meh, but did enjoy the way they made the house smell cinnamonny. The boy ate more than half of them. Always a good sign. Or maybe he’s just being a boy? In any case, these turned out not bad. Not great, but OK enough for me to see the potential in trying them again and getting it right this time. Cost Plus World Market carries cardamom…only $2.99 for a bottle of it! D’OH! Thanks for the tip, Colleen! That’s much closer than Little India!